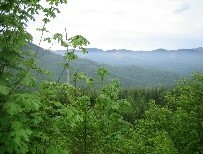 Sometime in the middle ages, say around 400 years ago, a few Douglas fir cones fell in a valley north of here. Those cones were probably gnawed by ground squirrels, pecked by birds, or rotted by the damp Oregon winter. Eventually, some seeds germinated and found nurture in the nearly 12 feet of deep, dark humus of a Pacific Northwest forest. Those seedlings survived many seasons of rain, drought, freezing, fire, disease, insects, and wind. They competed with other seedlings for room and sunlight under a dense canopy of branches far above the earth. A few survived and grew tall and straight. Once big, they became scarred by lightning bolts, fire, and the felling of their ancestors who could no longer withstand the elements. Their bark grew thick and protective, often more than a large man’s hand span deep, protecting the trees from the natural cleansing of fires. Many reached 350 feet tall. Today we call them old growth forests. There are some up on Mary’s Peak and even some in McDonald Forest. I have walked among the ancient grandparents (as a friend calls the old trees) up on Dimple Hill, but I recently visited the Valley of the Giants west of the ghost village of Valsetz, Oregon. This trip along the North Fork of the Siletz River in the Oregon Coast Range was a powerful experience. It is a commitment to visit these big, old trees. Once you reach Fall City, between Salem and Lincoln City, you still have over an hour and a half of driving on ill kept logging roads, minding the many right and left turns, before reaching the trail head. But, just driving in to the Valley of the Giants is wonderful. The gravel road twists and turns through valleys, over small creeks, and along ridges with vast views of the Oregon Coastal Range. In May, the road was lined with purple wild iris, red-orange paint brush, and lavender lupine. Bracken and sword ferns covered the hillsides along with salal and Oregon grape. Coming around one bend in the road we surprised a bobcat. It was either soaking up the sun or it had just jumped down the bank without hearing us coming. Its feet scattered gravel in all directions and it disappeared in a breath, leaving us wondering what had happened and if we had seen it at all. Farther along the road, we came to the gate marking the entrance to Valsetz. From 1921, to 1984, Valsetz was the company town owned by Weyerhaeuser. In 1980’s, the company closed the town, burning and bulldozing homes, stores, and schools, leaving nothing to mark the spot except the gate. Residents have scattered, but in Fall City there is an annual reunion of the families from Valsetz on the first Saturday in August. Recently, a memorial to “the people who lived or worked in Valsetz” was placed at the reunion site. A bit past Valsetz, the maps show the old Valsetz Lake Dam and mill pond. It was drained when the town perished, but we stopped along the road and, by reading the lay of the land, could see its size and shape. Grasses, shrubs, blackberries, and small trees are doing the work of reclaiming the land. Soon, it will be impossible to trace the pond’s location. Our trip to the Valley of the Giants was on an overcast day in late May. The Valsetz area is considered the wettest in Oregon with an average 169 inches of annual rainfall and the Valley of the Giants has registered as high as 300 inches in a year. We were sprinkled on, but nothing too serious. We took the long cut through King’s Valley to Fall City and followed William Sullivan’s precise and intricate directions to the trail head in his 100 Hikes/Travel Guide: Oregon Coast & Coast Range (1996). He suggests four wheel drive, but we saw several passenger cars going slow and easy. Once there, we had lunch in the parking lot and headed into the forest. It is not for exercise that you would go to the Valley of the Giants. The trail is only a mile and a half long and offers no exertion at all. This is simply a chance to take your time to really get to know an old growth forest first hand. Almost immediately, we began to see the Douglas fir and hemlock giants. Some were trusting and had meandered close to the trail, but many were shy, preferring to remain at a distance. Those close to the trail seemed to enjoy the caressing hands and words of wonder, posing sedately for pictures as we estimated diameters up to 12 feet. Those afar showed off their incredible height, filling the camera’s view finder from top to bottom. Our ooo’s and aaah’s started sounding ridiculous as each new tree was bigger than the last. Having been in old growth forests before, I was unprepared for anything so magnificent. I thought I had seen big trees. These coastal giants rival the redwoods in both size and stature. Perhaps the soft whispers that lurk in the forest are the ancient stories of the grandparents being told to the new generations. If you keep your eyes on the trees during your visit, you will miss the microcosm of the old growth forest floor. Wild flowers huddling in micro climates created by slight elevation or light changes. Ferns growing on stumps or the rotting trunks of downed giants. Birds and bugs churning the ground to make a hospitable place for fallen fir or hemlock cones to drop their seeds. Signs at the trail head remind us to stay on the trail. But, there is one invitation to step into the drama of the forest. The sign points to “The Big Guy”. 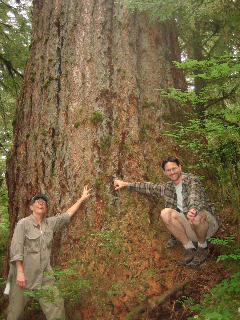 It was long considered the second largest Douglas fir in Oregon at 35 feet in circumference. Then, in 1981, it fell. With shallow roots in 12 feet of humus, the big firs and hemlocks are often the victims of coastal wind storms. The side trip allowed us to step into the rings of the tree. A hundred feet from its branching roots, this slice through the trunk showed that its diameter was more than my five and a half foot height. I ran my fingers along the growth rings, noting that my own 58 years amount to only a few inches in the life of “the Big Guy”. Walking in any forest is rejuvenating. Breathing in the fresh air and the quiet calms the harried mind, slows the breath, letting us regain our connection to nature. Walking in an old growth forest is more so. Its largeness and smallness allow humility to gain a foothold in our self-important lives and puts a much-needed perspective in place to fill our souls. In 1976, the Oregon Bureau of Land Management, designated the Valley of the Giants as an Outstanding Natural Area. The density of diversity in old growth forests is unmatched in young forests or plantation forests. In this 51 acre plot there are oxalis, monkey flower, rhododendron, salmon berry, salal, lilies, colorful fungi, the northern spotted owl, bald eagle, marbled murrelet, and a multitude of other species that make their homes in this amazing habitat. The forest floor itself acts as an organism, soaking up the heavy rainfall to moderate flooding in the Siletz River. I will forever be touched by these giants standing quietly, marking time in the forest near here. And, someday, I will take my grandchildren into these woods to visit the ancient grandparents. I will tell them it will be their job to continue protecting this ancient, mythical place. If you go, get precise directions from the BLM ((503) 375-5646, 1717 Fabry Rd., S.E., Salem, OR 97306) or follow the directions of William Sullivan, and call ahead for road conditions. The 28 miles of back roads are privately owned by the Willamette Industries, Boise Cascade, and Georgia Pacific, who often close them to the public during peak logging times. The Valley of the Giants is a day-use area. Camping and fires are not allowed. Follow leave-no-trace wilderness principals. There are no bathrooms or trash cans. 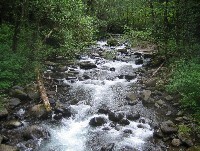 Keep in mind this is an area watershed.